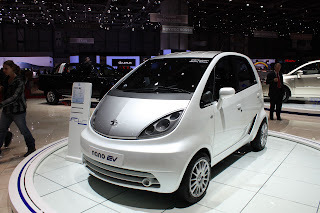 Tata Motors recently launched its new eco friendly car Tata Nano EV at 80th Geneva Motor Show. Tata Nano which has been launched last year is the worlds cheapest car. Tata is also planning to introduce electric Version of Indica Vista. Tata Nano EV is using super polymer lithium ion batteries. Tata Nano EV is expected to be the least expensive car in Europe as its price is under $10,000. The Tata Nano EV has length of 3.29 metres and a width of 1. 58 metres. Tata Nano EV will be a 4 seater with spacious interiors. Nanos electric engine can delivers a maximum power of 54 Bhp with a maximum Torque 115 Nm. Tata Nano EV has a topspeed of 110km/hr that can reach 0-60 kmph in under 10 seconds.